Christmas is here, the most wonderful time of the year! So the song goes, but what it doesn’t mention is that Melbourne’s the most wonderful place of all during the festive season. 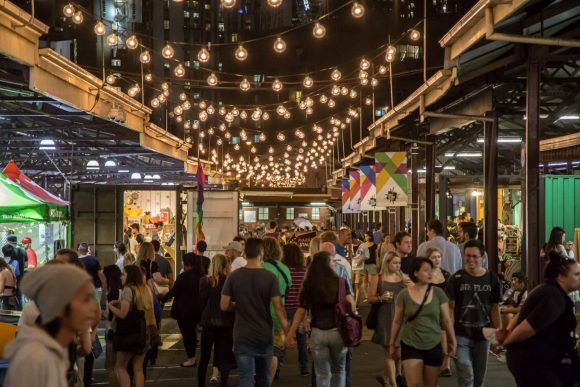 From Christmas Square at Federation Square to Santa’s new home at Town Hall, there’s endless fun for everyone. The centrepiece of Christmas Square at Federation Square is the giant tree. At 16 metres high, it’s bigger than ever! Behold the 192 individually-programmed LED branches and a new star perched atop the tree twinkling in the night sky. Make sure you get there to see its nightly multi-coloured light shows. 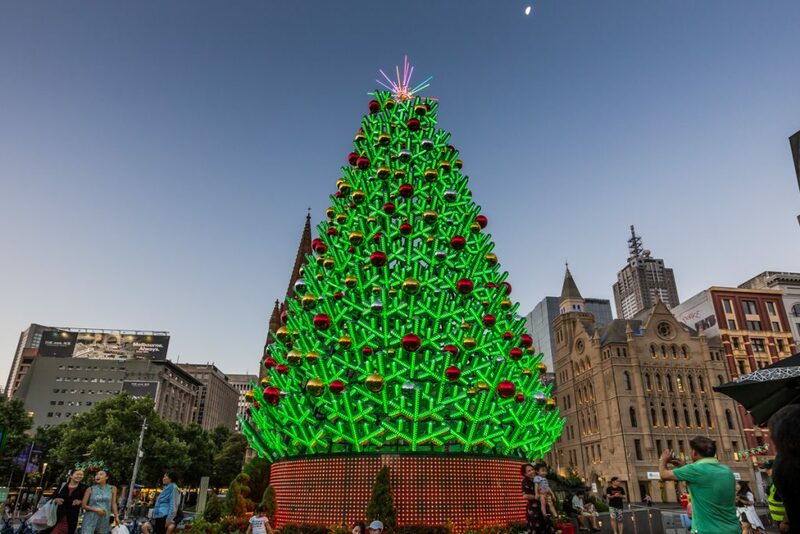 The 16 metre Christmas tree at Federation Square features nightly light shows. Another Christmas Square highlight is the Giant Christmas Bauble at Federation Square. It was a huge hit last year, and returns for another season of glittering by day and twinkling by night. You can walk inside this six-metre-high white wonder, which is a perfect spot for Christmas kisses and #melbmoment selfies. Friday 30 November to Tuesday 25 December. Federation Square and Docklands become visions of festive cheer during the Christmas season. Every night, magical, colourful Christmas Projections will show free animated shows, with illuminating ‘finger paint’ technology welcoming kids to join the fun. 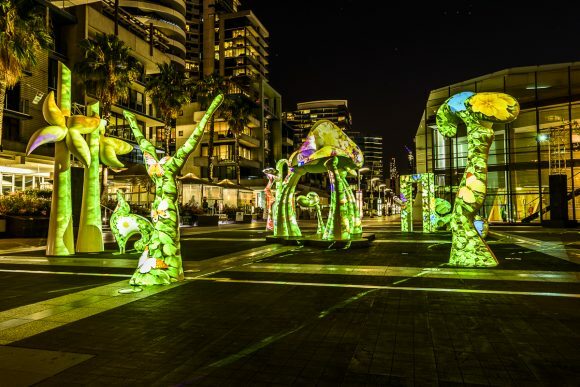 At Docklands, projections will be lit up along the ‘silence’ sculptures at New Quay Promenade with engaging interactive displays. Friday 30 November to Tuesday 25 December. 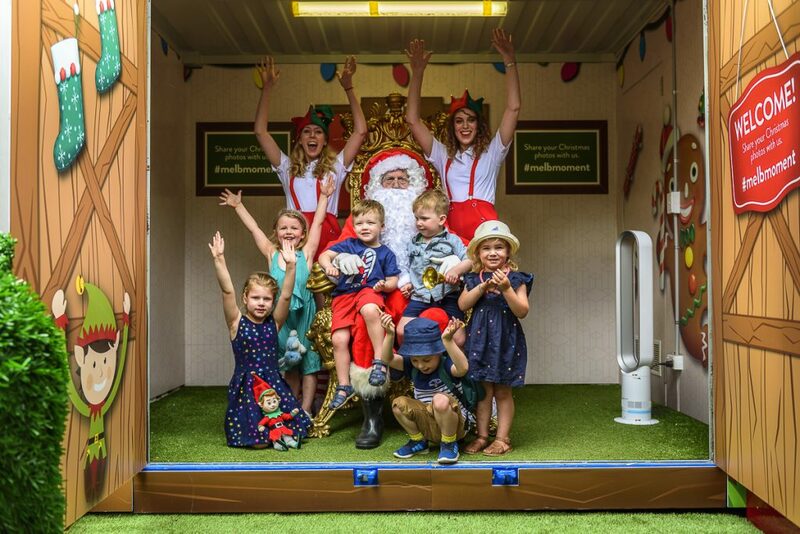 From 1 to 24 December, Santa will settle into his new home at Town Hall. Whisper what you want him to leave under your own tree, and get a free photo with this merriest of men. He welcomes one and all every day, 10am-12pm and 1-3pm daily, plus 4-7pm Thursday and Friday. Santa’s a very popular guy, of course, so queues may be long, but his roaming elves will keep everyone entertained. 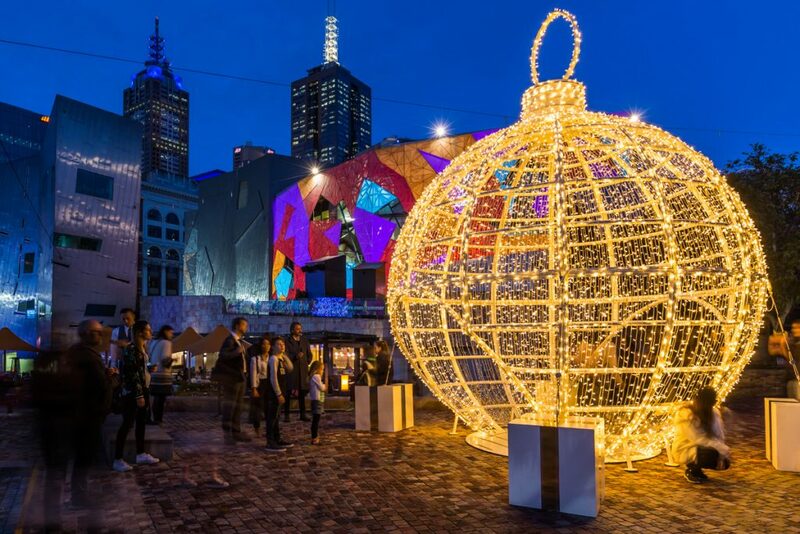 From the nativity scene to the giant bauble, Federation Square will be a merry fantasyland for Christmas 2018. But decorations are also glittering and glowing right across the city like never before. Check out Ribbons for Life, a new Insta-worthy interactive installation in Queensbridge Square filled with thousands of brightly-coloured ribbons, promoting TAC’s Towards Zero vision, and Melbourne artist Ash Keating’s distinctive dripping paintings. See it all from 30 November to 25 December. 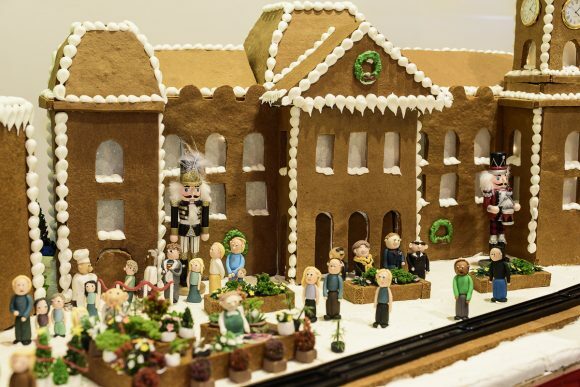 Follow the heavenly scent to catch some of Melbourne’s most recognisable landmarks recreated in gingerbread. With a new location in Riverside Gallery at Federation Square, the clever chefs are bound to add a new slice of real estate to the village. On display from 1 to 24 December. 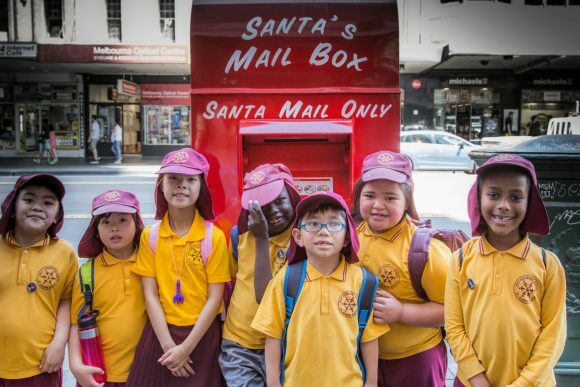 Australia Post is encouraging young Australians to write to Santa this Christmas. You’ll find Santa’s Mailbox and Giving Box just outside the Australia Post GPO on Elizabeth Street. There’s also a second letter box outside The District in Docklands. He’s a very busy fellow, but also totally magical, so every letter popped into these boxes will receive a reply from Santa! Include a self-addressed, stamped envelope and wait for the moment of delight when the postie delivers a personalised reply from Santa. Or give a little back this season and choose a present for someone who might otherwise miss out and drop it off at the Giving Box at Australia Post GPO. Throughout December, a specially-commissioned film by renowned Melbourne artist Beci Orpin will feature on Fed Square’s all-new, five storey digital facade. The festive film celebrates the true gifts of Christmas – families, friends and community. A heart-warming choir will score the film live over five special nights in December. 6, 13, 20, 21 and 22 December.